New changes are coming to the road that leads to Plantation Resort! 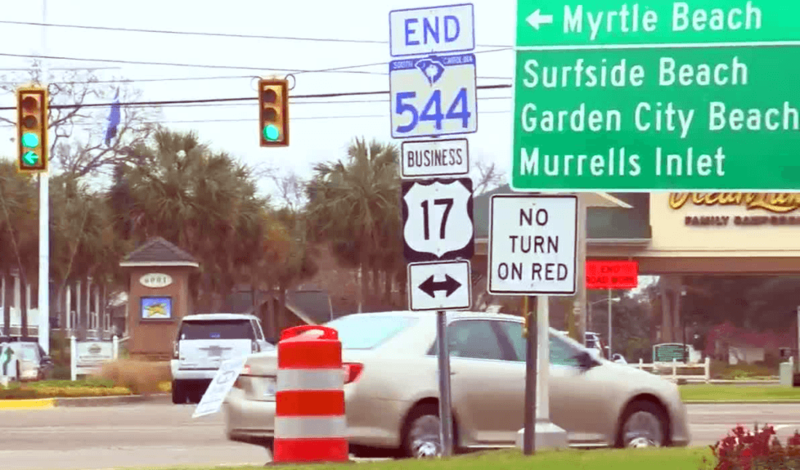 A major construction project along Highway 17 Business in Surfside Beach is under way to help improve traffic turning conditions and safety on the roads. A New Traffic Light will be installed at the Platt Blvd Entrance from Highway 17 Business. Platt Blvd is the road leading to the Resort. 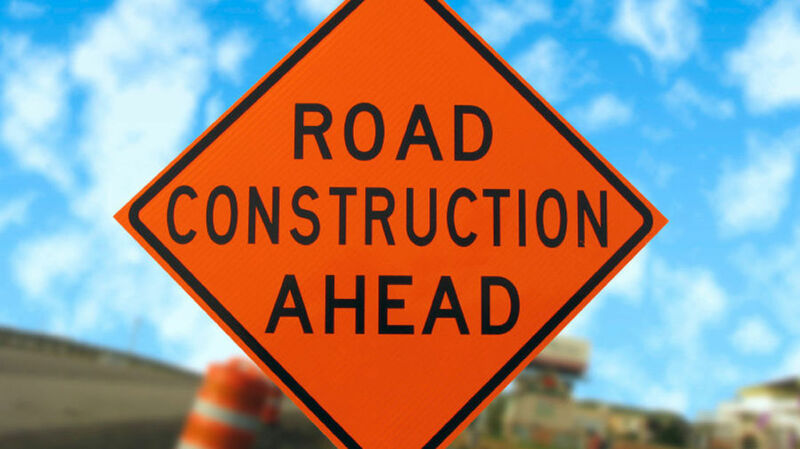 The Anticipated Completion Date for the road construction project is Mid-2020. South Carolina Department of Transportation crews recently broke ground on a major construction project last week. SCDOT’s resident construction engineer Derrick Tindall says this full construction project will be from Highway 544 to the intersection of Melody Lane on Highway 17 Business. He added crews will begin at Highway 544 and work south in the median area. Once construction is complete, concrete islands will be installed along the frontage road in the median areas. As a result, drivers will no longer be able to make left turns onto the frontage road. In addition, power lines that cross the road will be brought underground. Crews will install new storm drainage along the median in some areas and upgrades to the landscaping. Three new traffic signals will also be installed at Platt Boulevard, 10th Avenue South and 16th Avenue North. Tindall says contractors will be working on this project mainly during the evenings from 7 pm to 6 am. Tindall says the cost of this project will run somewhere between $13 to $14 million, with the anticipated completion date of mid-2020. 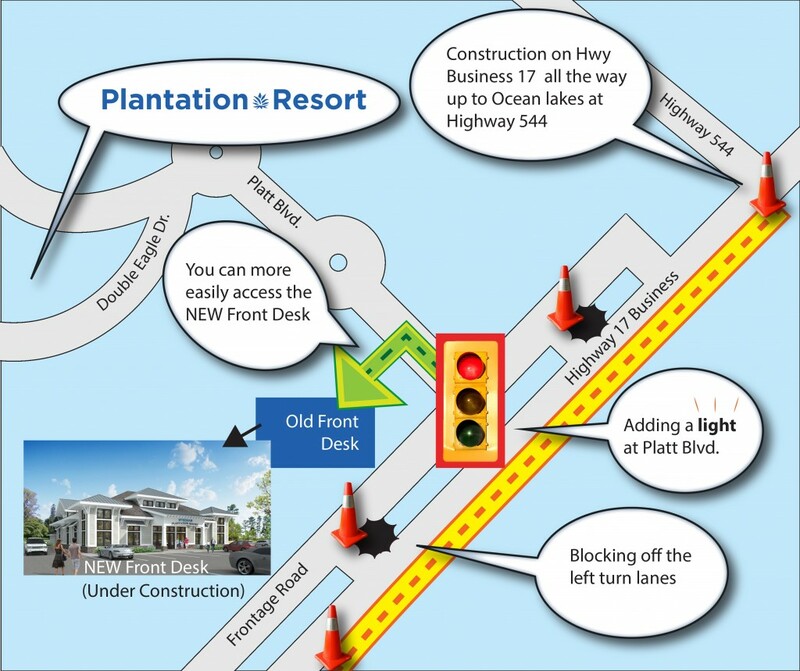 The New Front Desk will make checking into the Resort easier with these road changes. When the new front desk is completed, you will access the new check-in area by turning directly onto Platt Blvd (hopefully made easier by the new traffic light), then turning left crossing Platt’s oncoming lane where you’ll turn into the new Front Desk parking lot that is opposite the Preview Center. Rest assured there will be plenty of signs to guide your way and detailed maps making it a stress-free start to your well-deserved vacation. Click here to read the New Front Desk announcement. Our goal is to continually provide you with clear, up-to-date information about all the latest events not only at the Resort but in the surrounding community. We will post more information as we receive it to make it as easy as possible to navigate any changes made by this road construction. If you have any additional questions, please contact a friendly owner services representative at 888-913-4477 or via email at reservations@plantationresort.com. You can also rest assured that we’re dedicated to making Plantation Resort your vacation oasis and a beautiful vacation destination for now and for years to come. We hope to see you soon at Plantation Resort! What are the completion dates for the road construction on #17 and Platt Blvd and the completion date for the new Plantation Welcome Center. We are owners and we have plans to stay in May and again in early September. I just want to know what to expect when we arrive. The only date the state will give us on the road construction is sometime in 2020. We hope to have the new front office completed by the end of this year. Thanks for being an owner Larry! Will there be a way to bring a golf cart to the beach from plantation resort once this construction is complete? Great question! Hopefully, this will make it easier for a golf cart to turn in and out of Platt Blvd, especially with the heavy summer traffic. “Turning left from the end of 544 onto highway 17 business ( south ) . Don’t you mean turning right? Great catch! Yes. You turn right onto Business 17. Makes no sense. With Deerfield stopped at light can’t make left into registration.